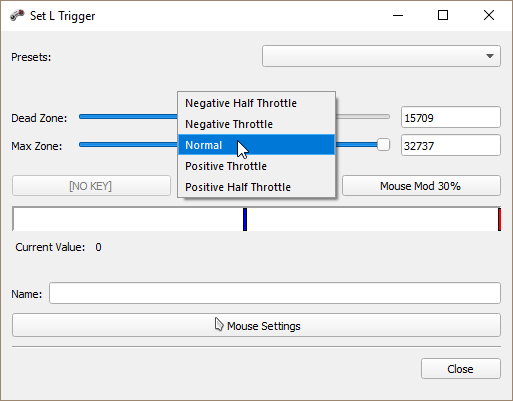 What do the negative/positive throttles in the DS3 trigger buttons do? I have no idea what the difference between the five options of throttle. In whatever choice, only one button is triggerable even both two are assigned, be it's pressed slightly or held long. The emulator in use is AntiMicro. FYI: Are questions asking about a feature of controller emulators on-topic? AntiMicro is not properly recognizing your controllers. Not the answer you're looking for? Browse other questions tagged ps3 controllers emulation or ask your own question. What is the PS3 Jailbreak? What happens to the essence? Using the Mayflash GameCube to USB adapter. All buttons work except the C-Stick? What lubricant does Sony use for the PS3 analog stick? How do I stop my PS controller from powering off when I press the face buttons? What do I do if my dual shock controller has two circle buttons?